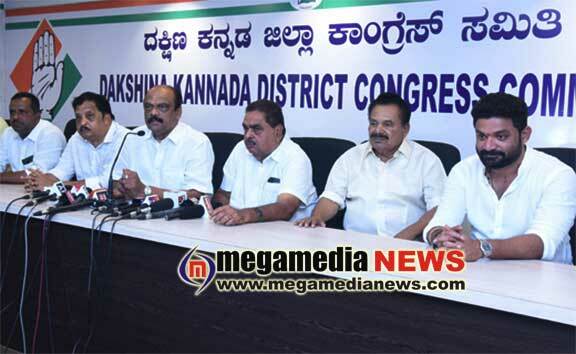 Mangaluru: The Congress and Janata Dal (Secular) jointly hold a press meet in district congress office on Sunday put up a united front to back Congress candidate for DK parliamentary constituency – Mithun Rai. Harish Kumar, president, Dakshina Kannada District Committee said the joint committee will formulate strategies to ensure that young candidate that Congress high command has given in Mithun comes out on top. “We have finished booth to district level training and conference for our workers and all are keen to ensure that reign of BJP in this part of the state is over and a youth leader represents its aspirations in the Lok Sabha,” he said. Congress-JD(S) leaders will hold a meeting at Kudmul Ranga Rao Town Hall at 10.30am on March 25 before Mithun heads out to nearby DC’s office and file his nomination papers at 12.49pm, he said, urging leaders and party workers of the two parties to attend the same in large numbers. The district Congress leadership had sought a fresh face for these polls and it is now turn of the all to ensure that this new face wins in the election, he said. Mohammad Kunhi, president of district unit of JD(S) said the Congress high command has chosen a ‘winning’ candidate in Mithun Rai, who will help bring about a change. “Failures of the BJP will be the biggest boost for the candidature of Mithun. In addition, welfare schemes given by the coalition government headed by H D Kumaraswamy will ensure that the voters make their informed choice in favour of the candidate of the coalition,” he said. Unhappy Leader Mithun Rai likely to get Lok Sabha ticket … Offer from Congress!